Although the skies darken as winter spreads across Poland, December can be a great time to visit the capital city of Warsaw, which will be covered in festive decor and lights for the holiday season. 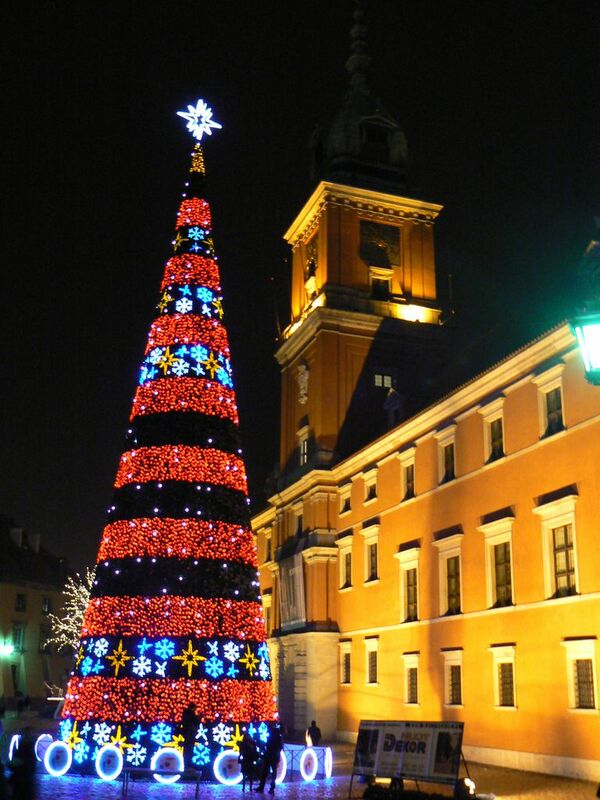 Although nights can get quite cold and days are often overcast, there's still plenty to do and see in Warsaw this time of year—especially if you're looking for a way to get in the Christmas spirit. Warsaw's winter is not usually unbearable, but temperatures have been known to dip well below freezing in the coldest years. Still, the average temperature in Warsaw for December is just below freezing at 31 degrees Fahrenheit (-1 degrees Celsius). You can expect rainfall 15 days this month, accumulating a total of 40 millimeters on average each year in December, though some days only see a slight drizzle for a few hours. Additionally, much of the month is also overcast, resulting in an average of just one hour of sunshine per day. Pack warm clothing for December travel to Warsaw, and be sure to follow tips for winter dress by using layers to keep you comfortable as you explore Poland's capital city. You'll also want to make sure you bring a winter coat; sturdy shoes that are comfortable for walking and waterproof; warm socks, gloves, scarves, and hats; and maybe even thermal leggings or undergarments for an added layer of warmth against the winter chill. Due to the likelihood of rain in December, you should also remember to pack an umbrella and raincoat. If you plan on doing any shopping at the holiday markets around the city, you should also plan to leave extra room in your luggage for those last-minute Christmas gifts. From festive holiday markets to international film festivals, there's no shortage of things to do in Warsaw in December. Whether you're hoping to find the perfect handmade gift for your loved ones back home or you want to experience a traditional Christmas Eve feast, Polish style, December is chock full of festive events and cultural celebrations. Human Rights in Film Festival: An annual event featuring documentaries and films about the struggle and movements in Poland and abroad for preserving human dignity for all of mankind, which is hosted by the Helsinki Foundation for Human Rights in mid-December each year. Christmas Eve Feasts: On the evening before Christmas, restaurants across the city will offer guests traditional Polish meals featuring menu items like prune dumplings, meatless pierogis, and poppy seed cake. As per tradition, no meat is to be served or consumed on Christmas Eve. Christmas Markets: Some of the biggest winter attractions in Warsaw, the Christmas Markets, begin popping up across the city in early November but run through the rest of the season. While the market in Old Town is more popular, another Christmas market also appears near the Palace of Culture. St. Stephen's Day (Holy Szczepan): A celebration of the first Christian martyr that takes place on December 26 each year, this annual event features a day of masses at Catholic churches across the city. New Year's Eve: On December 31, you can head to Old Town for the fireworks display or spend the night celebrating at a number of clubs and restaurants across the city that will be hosting special events of their own. Old Town takes on a festive atmosphere with decorations, lights, and Christmas trees, which is sure to get you in the holiday spirit on your trip. Although airfare and accommodation pricing is lower toward the beginning of the month, prices drastically increase over the last ten days of the month due to the Christmas and New Year's holidays. Be sure to book your travel itinerary in advance, especially if you are planning on visiting during the holidays, as accommodations are likely to fill up toward the end of the year. In warm weather, many of Warsaw's must-see sights can be visited on foot. If cold weather prevents you from enjoying walks to major sights, you can also utilize the city's public transportation. Government offices, banks, and other federal establishments will be closed on Christmas Day and St. Stephen's Day since both are observed as federal holidays in Poland. You may find some bars, restaurants, and clubs will remain open, though.